It used to be called a corkscrew but US manufacturer Coravin is so confident in its new technology that it has come up with a completely new name. 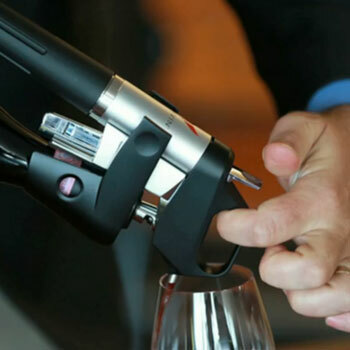 The Coravin Wine Access System leaves the cork in place, which helps to protect the wine from oxidation and leaves the wine to evolve naturally. The new technology works by passing a thin, hollow needle through the foil and cork and into the wine. The bottle is then pressurised with argon, an inert gas that is used by some winemakers. The pressure from the argon then pushes the wine back through the needle and into a glass without any oxygen getting into the bottle. Once the needle is removed, the cork naturally reseals itself and the remaining wine “continues to evolve naturally”. The company hopes that this new system will enable restaurants to offer a broader selection of wines by the glass, as it should not lead to the oxidisation of wine. Joe Bastianich, American restaurateur, winemaker, and Coravin investor, said: “As a winemaker myself, I was very protective of the delicate nature of wine and took special care with the by-the-glass offerings at each of my restaurants. The Coravin 1000 system is now available for US$299.